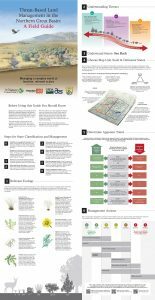 The SageSHARE partnership, based in Burns, Oregon is proud to release this Field Guide as our latest tool supporting conservation in sage-steppe habitats across the Northern Great Basin. es and beautifully illustrates the threat-based land management approach. 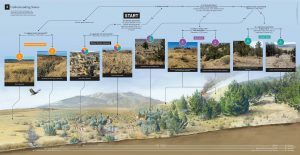 The guide walks practitioners through a six-step process to understand, identify and efficiently manage invasive annual grasses and encroaching conifer woodlands on large landscapes. er and folds down to 8½” x 11”. nities with both foreground detail and broad landscape patterns. local, state and federal partners. SageSHARE is soliciting interest in training for field-based professionals to learn how to use this approach at a variety of scales. Additionally, we can answer questions and host demonstrations for administrative professionals needing to understand how threat-based land management supports other approaches such as Resistance and Resilience, or how it fits into a full management plan.